Julbord Tastings of Norway and Sweden! 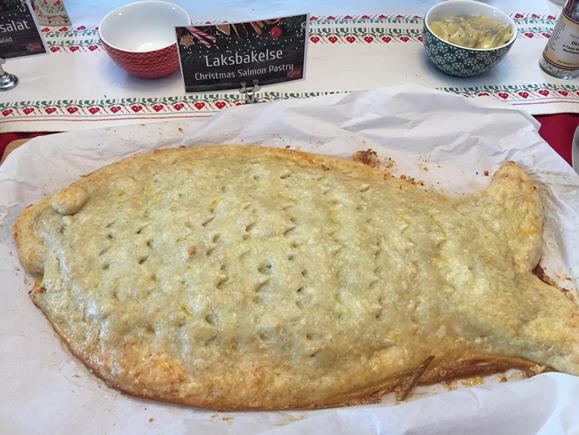 For years, Christmas time for me meant Lutefisk (lute-fisk) and Lefse (leff-suh); Krumkake (kroo-m-kai-kuh) and Grot (Groot). 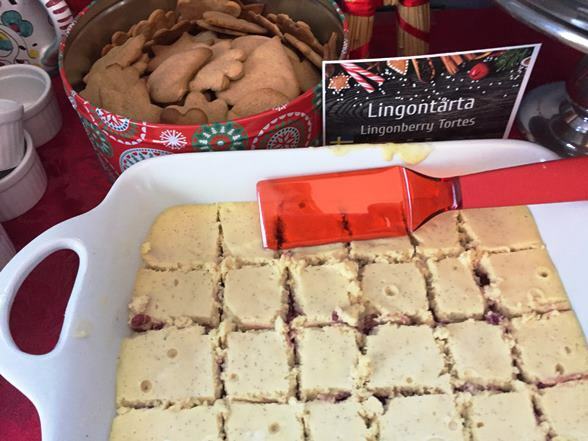 Both of my Norwegian and Danish grandmothers would make these traditional Norwegian dishes during the holidays. 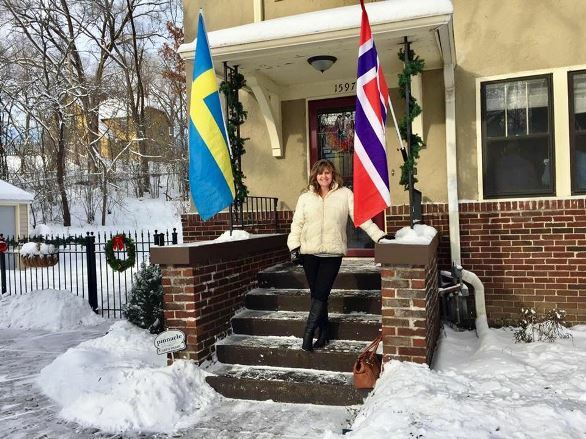 As a young girl, I loved the lefse and pastries, but you wouldn't catch me anywhere near the lutefisk. Lutefisk is a whitefish from the Nordic countries that is traditionally prepared by having the fish dried then soaked in cold water and lye for days until the fish is edible for cooking. More info on lutefisk here. As the lutefisk is cooking, the smell alone is strong enough to make a Viking grab his Norse helmet and run. Of course, a true Viking or Norski would never do that. You might say the smell of its bark is worse than its bite! I finally tried the smelly fish when I was old enough to realize I needed to own it and make my ancestors proud. Let's just say, it wasn't as bad as I had made myself to believe. However, no time soon, would I make a good candidate as a Norwegian ambassador. Let it be said, though, I could own – "been there, tasted that, got the T-shirt!" Some Scandinavian T-shirts actually challenge, "Try the lutefisk at your own lute-risk." 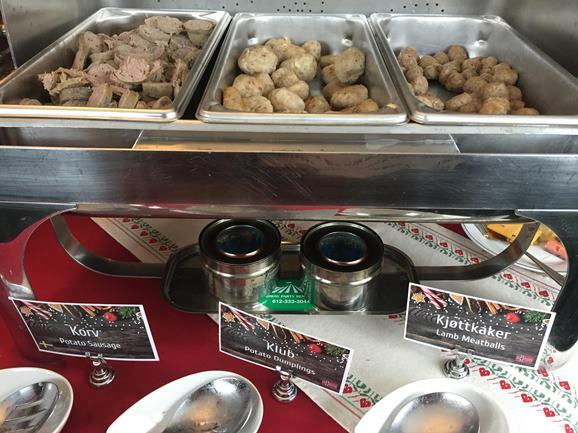 Besides lutefisk, there are far more other Norwegian and Swedish goodies to rave about, which I had the opportunity to feast on during this holiday season. 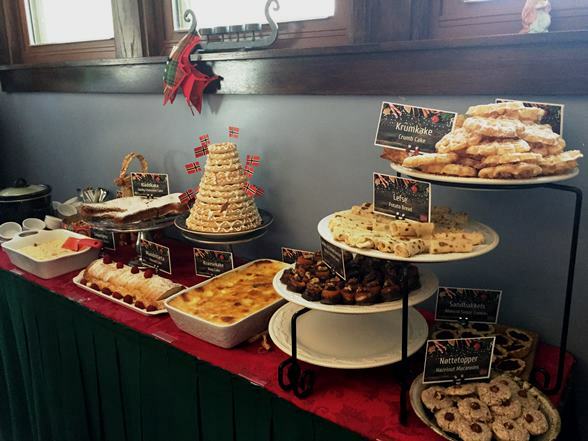 My mother-in-law invited me to an annual Julbord (yewhl-board, meaning: Christmas table) that was beautifully prepared and presented by her good friend and her friend's son from North Dakota. Before the feasting began, our hosts gave us a little lay of the Julbord land. Their guest, a minister, lead us in prayer then ending with us singing the first verse of Joy To The World; nice touch to start our holiday tasting. The first thing on my plate was a piece of this salmon pastry. I couldn't avoid it; my eyes were being seduced by the golden puff pastry shaped as a fish. The second it hit my plate, I had to sample it. 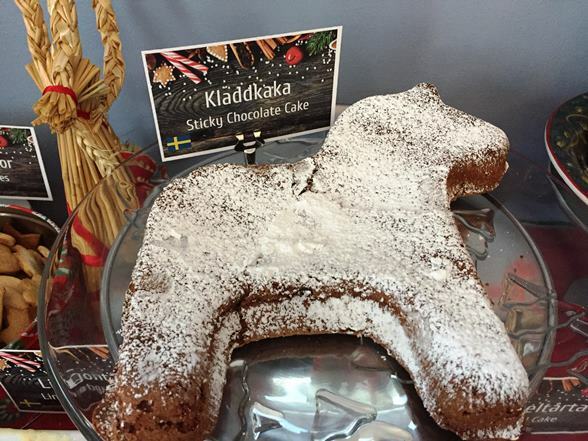 Possibly, it was poor manners to nibble while scooping around the Julbord, but I must say, I was not disappointed! The flaky puff pastry wrapped around the tender salmon was a combination of smokiness from the salmon and the buttery sweetness of the pastry. Incidentally, this ended up being my favorite of all. Next was the potato dumplings and potato sausage. The Swedish and Norwegian's use potatoes quite often in their foods. Lefse, flat tortilla type bread, is also made from potatoes. Potatoes are easily cultivated in the Norwegian climate and soil. I found a little tidbit in regards to the potato priests that first brought the potato to Norway and then the rest is history. Check it out here. Also heavenly, was the creamed potatoes and fish. It was sort of a thinner sauce that you'd find with scalloped potatoes, along with small bits of fish and onions. The silkiness of the cream and butter made this dish incredibly flavorful. I went back for seconds. Salmon pastry too! You know I did!! 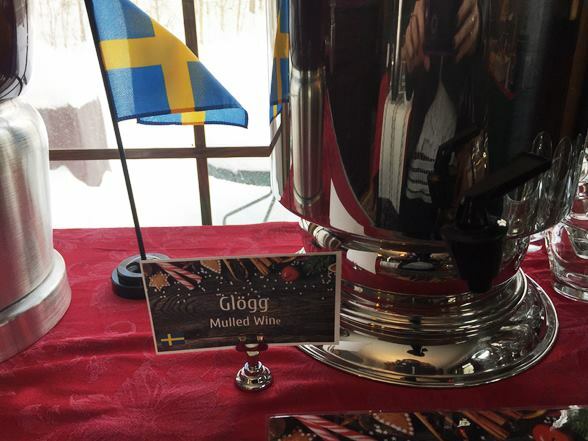 A nice variety of beverages were offered and I decided on the glogg (pron. gloog), a mulled wine. It’s a warm spiced wine with a zippy kick that could, undoubtedly, on a cold day thaw your toes, your innards; right up to the frost on your nose. It's a necessity in the North Country. Other yummy foods were red cabbage, ham and lamb meatballs. Of course, the seduction of the salmon pastry was only the foreplay to the DESSERTS. 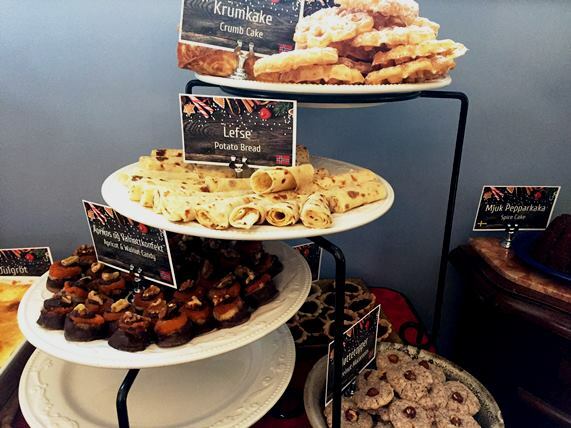 Lefse, krumkake and rosettes oh my! Following up with sticky chocolate cake, lingonberry torte, ginger cookies and ring cake. The savory nuances followed by the jewels of sweetness were a wonderful finale to this delightful Julbord. Thank you to our gracious hosts for all the hours of work it took to make these delicious Norwegian and Swedish foods. Also, thank you to my mother-in-law for inviting me and sharing in the festivities. I’m sure my grandmothers were smiling from heaven!!! This is my Swedish grandmother's kitchen! I'm filled to the brim with memories. Thank you! Awesome Diane! So glad you stopped by - Merry Christmas! This Irish girl is intrigued! Impressive presentation and write up. You won't catch me trying lutefesk... I'll leave that up to you. 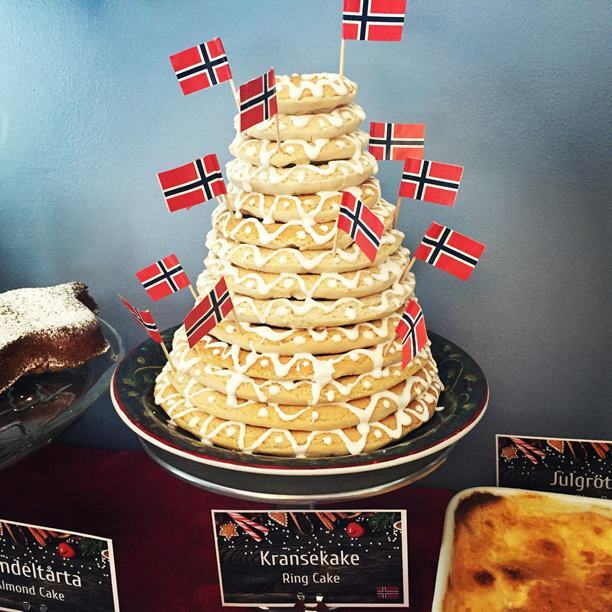 Had many of these delicious foods while my grandmother and her sisters were alive (and listened to them speak Norwegian while they created our feast!). So sad to think that many of their recipes are now only a memory from my childhood. Wish I would have taken an opportunity to learn how to make these and be able to share today. Thanks, Laurie, for bringing back such wonderful memories! Merry Christmas!! So great Melanie! I remember my great grandma speaking Norwegian too. Sadly, I agree that many of these traditions are disappearing. However, it's not too late to bring them back or start new ones. Merry Christmas! Thank you Julia! It looks like we have something in common. Loved your Scandinavian Christmas Guide on your blog. Fantastic info and pictures. All of it looks so delicious. What a fun tasting. I love trying foods from other cultures. Yes, I agree Rebecca. Some of these I grew up with, but a few were new to me and that made the sampling fun. Of course, it's always great when someone else has prepared it all. This was greatly appreciated!